Owing to exceptional demand we are unable to accept new members other than Juniors [under 21]. As we are a part of British Shooting’s Disability Hub Club we will accept applications from disabled persons. The situation will be reviewed in September after collection of the annual subscriptions. Havant Rifle & Pistol Club is a Home Office approved club. Membership is open to both newcomers to shooting and experienced shooters. The Club provides equipment for newcomers but when becoming full members individuals are expected to provide their own. There are no storage facilities at the club for members to use. As a responsible club, every effort is made to ensure that our members are suitable people to hold Firearms Certificates and our application procedure will necessarily involve some questions which will help us verify that. We are obliged by law to inform the police of new applicants so that checks may be made. Please note you will not be able to handle firearms or air weapons at the club until a police check has been completed. When the police check has been completed the Secretary will invite you to start your training sessions during which time you will be able to handle firearms and air weapons under supervision. Training sessions commence on the first Sunday of a month. The first three are safety sessions followed by shooting training the next month. These are taken by qualified instructors. After the first three sessions you will be asked to pay your Probationary subscription. To qualify for membership you will need to be able to demonstrate that you are safe to be on a range and that you have made a minimum of six attendances during your three month probationary period. Applicants under 16 are only permitted within the club providing a parent or guardian remain on the premises at the same time. If you are interested in joining the club the following four steps apply. Contact the club via our contact page and arrange a visit to the club on a Sunday at 12:00 for an initial introductory chat, to view our facilities, discuss membership and the shooting disciplines we participate in. This is also an opportunity to complete/submit a membership application form. A passport type photograph is needed for your ID badge. On receipt of a membership application form the relevant police check will be requested. When the police check has been completed the new applicant will be advised of this in writing by the Secretary. *Probationary membership is for three months after which time prospective members will normally be invited to join the club. *Junior membership until 21 years old; Student membership 21 – 23 years with student ID. Prospective members will be advised by the Secretary which Sunday they can then attend to commence their probationary period. On your first visit one of our instructors will explain probationary membership to you. Initially £5.00 is payable to cover ammunition costs etc for the early training sessions. During the first three weeks you will be given tuition in the safe handling of weapons, range safety rules and range etiquette and the various shooting disciplines available at the club. After these visits you will be required to pay the Probationary Subscription. It is from this point that your three months Probationary period starts. For obvious reasons we have to be very strict on safety. Until our instructors have signed you off as safe and competent your attendance will be restricted to Sundays, starting at 10:00. A probationer’s form will be started to record your attendance. Once this has been set up, you must ensure that it is signed and dated by your instructor on each visit. After the probationary membership fee (see below) is paid the Secretary will write to the applicant’s referees. 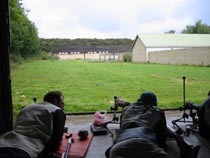 All members, probationary or full, pay a range fee each visit to cover heating, lighting and targets, currently £2.00. When the three month probationary period recording a minimum of 6 attendances has been completed and our instructors have signed you off as safe and competent the Secretary will arrange for the probationer’s details to be added to the agenda for election at the next available committee meeting. The minimum age is dependent on the ability and maturity to handle a firearm safely. It is a legal requirement that a parent or guardian remains with an under-16 child whilst they are on Club premises. For non-shooting parents this generally means sitting in the Clubroom whilst the child is shooting. Use of ranges is restricted to probationary and full members only. Visitors to the area may use the facilities (under supervision) but only if they are experienced shooters from another club and hold the relevant certificate. No-one is forced to enter competitions, but as a competitive target shooting club, all members are expected to have a go. There are many competitions, and you will find your own level, competing against others of similar ability. A range officer or section captain will tell you how to go about this. However, shooting is different things to different people, and we all enjoy it in different ways. Details of the club opening times are available under the tab headed Facilities. Generally Monday evenings are for Light Sporting Rifle, air rifle and air pistol. Tuesday evenings are for prone 25 yards rim fire, Thursday evenings are for air rifle and pistol and Friday for Bench Rest. The outdoor ranges are used when these evenings are light enough – roughly mid-April to mid-September. New members may check with section captains or longer-serving members for the arrangements at weekends. However, all members are reminded that shooting outdoors is NOT permitted between 21:30 hours and 08:00 hours without prior agreement. There must be at least two people present on the premises before shooting is permitted to take place. A person who is not a probationary member of the Club, but who is a full member of another club and/or holds a firearm certificate, and who visits the Club’s premises at the invitation of at least one member of the Management Committee. 3) pays the visitor’s fee and range fee.